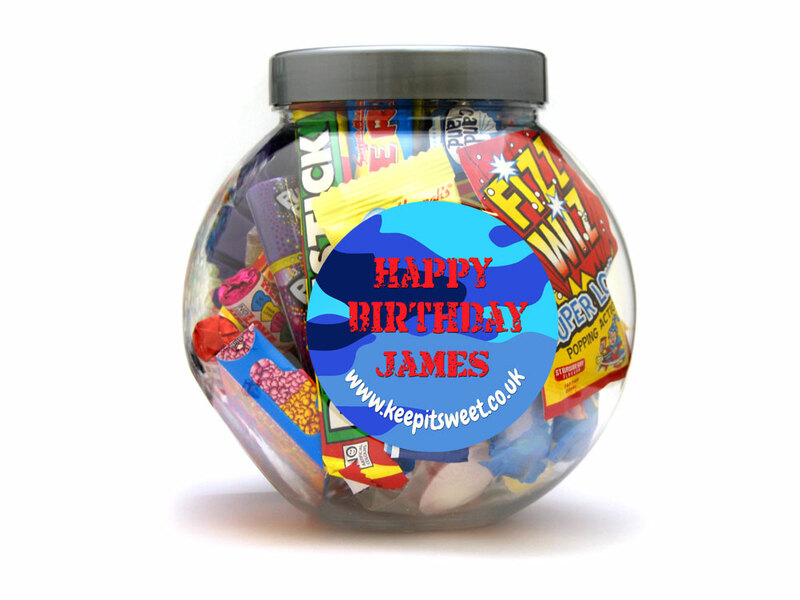 Personalise this fantastic 3ltr jar of sweets for a special boy in your life. 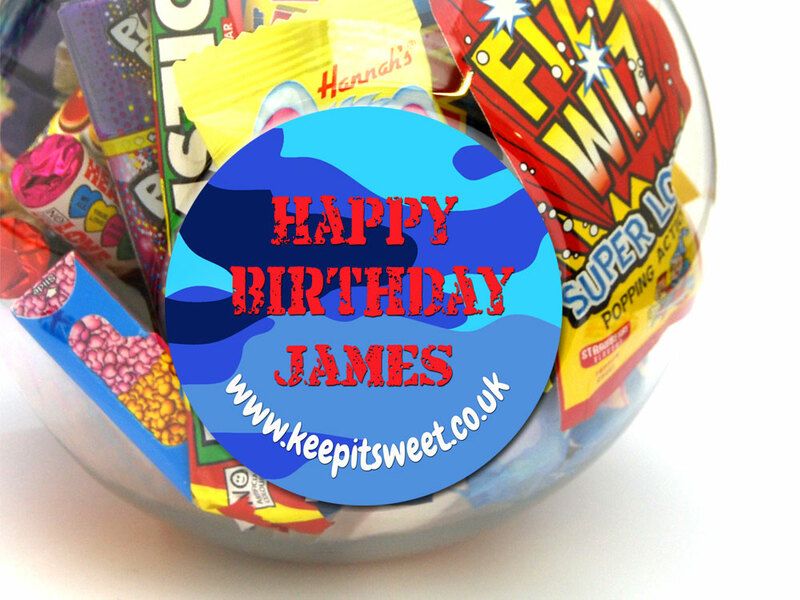 Filled with all your favourite retro sweets. Drumstick Bar: Glucose Syrup, Sugar, Vegetable Oils (Palm, Palm Kernel), Acidity Regulator (Citric Acid), Gelling Agent, Gelatine, Flavourings, Emulsifier (Glycerol Mono Stearate), Colour (Anthocyanin). Warning: Choking Hazard. Not suitable for children under 36 Months. Candy Watch: Dextrose, Glucose Syrup, Citric Acid, Flavouring, Colours (E102, E110, E129, E133). Anti-Caking Agent (Magnesium Stearate). Warning: Choking Hazard. Not suitable for children under 36 Months. Sherbet Fountains: Sugar, Treacle, Wheat Flour (with added Calcium Carbonate, Iron, Niacin, Thiamin), Cornflour, Sodium Bicarbonate, Citric Acid, Tartaric Acid, Liquorice Extract, Anti-Caking Agent (Tricalcium Phosphate), Natural Colour (Plain Caramel), Flavouring, Aniseed Oil. May contain traces of Wheat. Sherbet Fruit: Sugar, Glucose, Citric Acid, Vegetable Oil, Sodium Bicarbonate, Flavouring, Colours (E104, E102, E110, E142, E133, E129. E102, E104, E110, and E129). KP Dip: Flour (Wheat Flour, Calcium, Iron, Niacin, Thiamin), Sugar, Palm Oil, Rapeseed Oil, Dried Whole Milk, Lactose (Milk), Fat Reduced Cocoa Powder, Dried Skimmed Milk, Dextrose, Whey Protein (Milk), Partially Inverted Sugar Syrup, Raising Agent (Ammonium Bicarbonate, Sodium Bicardonate), Dried Whey (Milk), Salt, Cocoa Butter, Emusifier (Soya Lecithin). May contain traces of Milk and Soya. Giant Fizzers: Sugar, Acidity Regualtor (Malic Acid, Stearic Acid), Sodium Bicarbonate, Modified Starch, Magnesium Stearate, Anti-Caking Agent (Magnesium Carbonate), Colours (Anthocyanins, Copper Chlorophyll, Curcumin, Lutein, Paprika). Giant Parma Violets: Sugar, Stearic Acid, Modified Starch, Glucose Syrup, Magnesium Carbonate, Colours (Anthocyanins). Milk Chews: Glucose Syrup, Sugar, Fully Hydrogenated Coconut Oil, Gelatine, Humetant (Glycerol), Gelling Agent (Gum Arabic), Flavourings, Dextrin. May contain traces of Milk. Strawberry Chewits: Glucose Syrup, Sugar, Strawberry Juice from Concentrate (3%), Vegetable Fat (Palm, Coconut, Contains Soya), Lactic Acid, Egg White, Hydrolysed Pea Protein, Flavouring, Concentrates of Blackcurrent and Blackcarrot. May contain traces of Egg and Soya. Refreshers Roll: Sugar, Malic Acid, Sodium Bicarbonate, Stabiliser (E470b), Maltose Syrup, Vegetable Fats (Palm and Shea, Maltodextrin, Flavourings, Colours (Paprika Extract, Curcumin, Chlorophyllis, Cochineal). May Contain Traces of Wheat and Gluten.